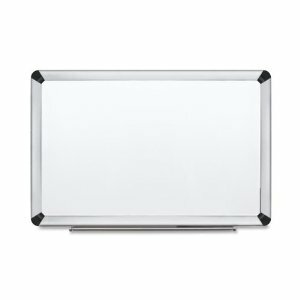 The Quartet Prestige 4 month dry erase whiteboard is a large whiteboard that finds use as an excellent planning tool. The surface, as the name implies, is separated into 4 areas that are completely erasable. Each area of the calendar is for a month – this makes the Quartet Prestige an excellent whiteboard for anyone doing quarterly planning. The board is conveniently sectioned into the months, as well as days. Weekends are denoted by a distinct color difference from weekdays, making work week planning easier. Each day has its own box and note area where you can write the appropriate notes, schedules, meetings, appointments, or tasks. This 4 month calendar board measures 3 feet wide by 2 feet tall and comes with its own dry erase markers tray that is attached to the center of the bottom edge of the board. The trim, and tray, are a subdued graphite color that is perfect for the office or home office. As an added bonus, this whiteboard comes with 4 free dry erase markers and an eraser. 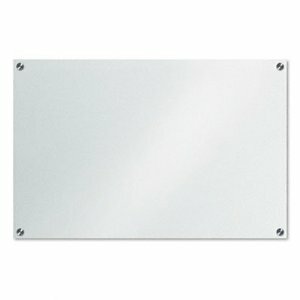 The surface of the Quartet Prestige large white board is known for its quality manufacture and ease of erasing. The surface does not ghost and is easy to clean off, even after leaving marks on it for some time. Remember to use a regular cleaning and maintenance schedule with your large whiteboard – a little time and effort can make these surfaces last for years. 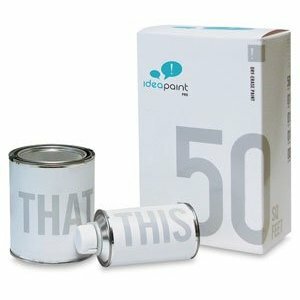 If you have left dry erase marks on a board for more than a couple of days you should use some whiteboard cleaner to make sure the marks come completely off. Also included with the white board is the standard Quartet “quick” hanging system. There are no complaints about this system – it is simple and allows for the board to be easily hung on a wall, or wherever needed. 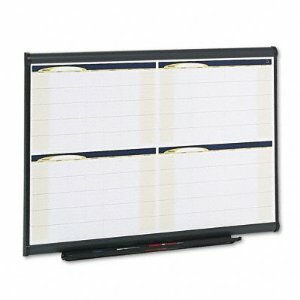 If you are looking for a planning board with a built in calendar then this whiteboard might be the one for you. With a quarterly layout, a high quality surface, included eraser and dry erase pens, this board will help you get organized and plan from the start.